Sr. Pat McKee, O.P. teaches volunteer tutors at Aquinas Literacy Center how to use a SmartBoard. June 1, 2016— Sr. Patricia McKee, O.P. never lets age stop her from keeping up with technology. 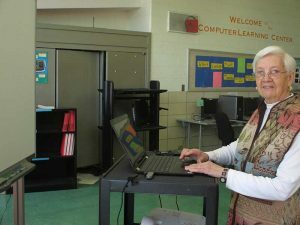 This 80-year-old Adrian Dominican sister uses the SmartBoard Aquinas Literacy Center on the three days a week she volunteers there. A SmartBoard is an interactive white board that has a touch-screen and recognizes when a person writes on the board with electronic markers or erasers. Sr. Pat utilizes the SmartBoard to teach English to the adult immigrants served by Aquinas Literacy Center, which is sponsored by the Adrian Dominican Sisters. She finds that the SmartBoard allows for greater hands-on learning. Using the templates that come with the SmartBoard, Sr. Pat has created games and other activities to facilitate learning vocabulary, forming complete sentences, and review. For 20 years, Aquinas Literacy Center has served the immigrant community by offering free, individualized instruction in the English language. The Adrian Dominican Sisters founded Aquinas Literacy Center in 1996, and they continue to sponsor the organization. For more information, email info@aquinasliteracycenter.org or call (773) 927-0512.